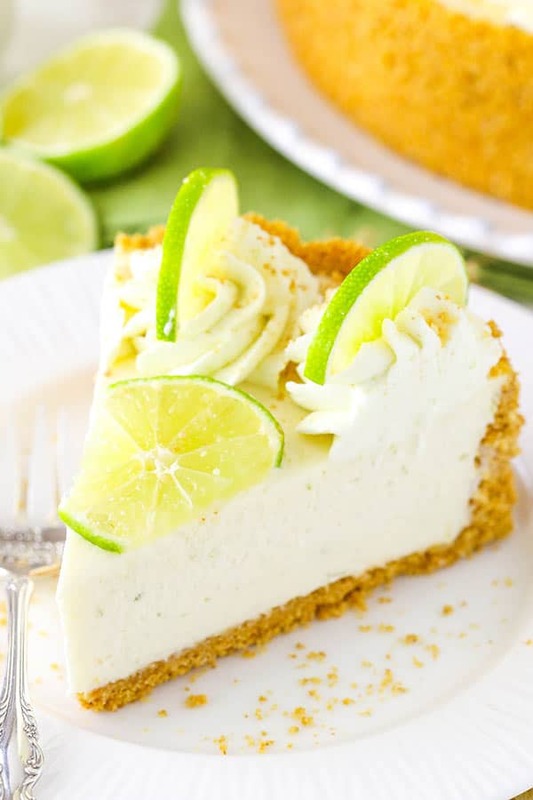 This No Bake Key Lime Cheesecake is full of delicious key lime flavor and so light and creamy! Plus, being no bake it’s a great way to finish out the summer and all this hot weather. About this time of year, I start to wonder if I’d rather hang on to summer a bit longer or see fall make it’s arrival. I feel like we’ve had a relatively mild summer, but it’s definitely pretty warm this time of year and I’m never sad to see fall temperatures. However, it’s been one crazy busy summer and I don’t feel like we’ve gotten to fully enjoy it. I’m still hoping that in the next few weeks, we’ll get a chance to get out on the lake and enjoy a day with the sun on our skin. Not to mention that I’m not entirely sure I’m ready to say goodbye to some of my favorite summer flavors. I love all the fresh fruit of summer and I’m already sad to see less of it available and not so much on sale. And then there’s the tropical flavors of summer like pina colada and key lime. Is it even possible to get tired of those? I think not. 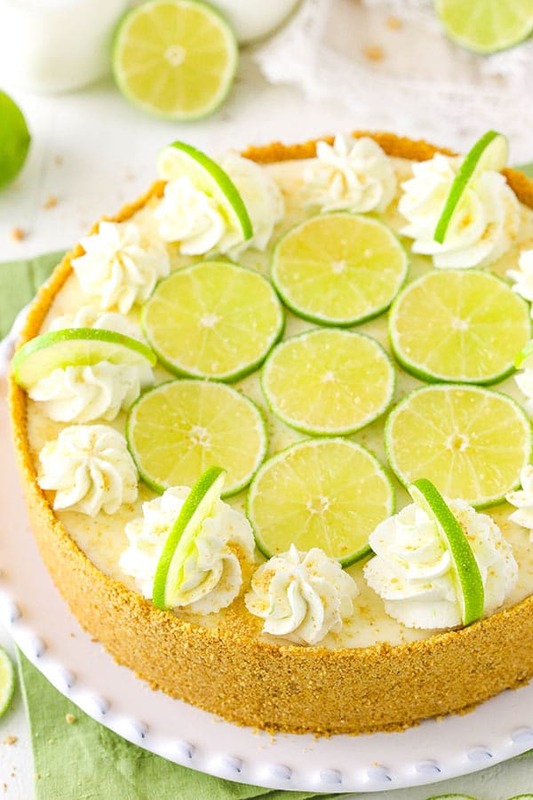 So today I’m holding onto summer just a bit longer with this No Bake Key Lime Cheesecake. And if you live in an area where heat + turning on your oven = no good. This cheesecake is even better for you. It’s easy to make, cool and refreshing. Bring it on! This cheesecake gets started with a classic graham cracker crust. I like to add a touch of sugar to my crusts, which I did in this one. It just takes it up a notch and I’ve never been one to shy away from a touch more sugar. 🙂 I did happen to bake this crust, but you absolutely can pass on that step if you prefer and want it truly, hard-core no bake. I just like to bake it quickly because the crust holds together better when you cut into it. Your call though. 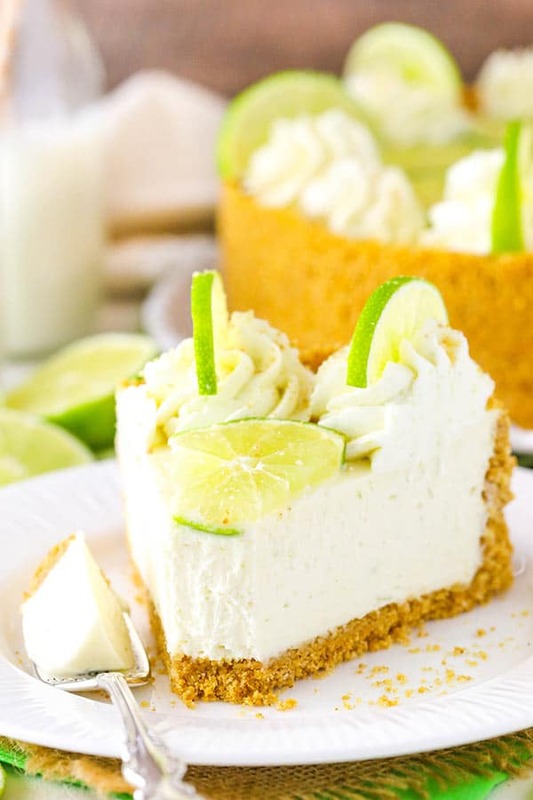 Top the cheesecake off with some swirls of whipped cream and slices of key lime (or limes) and you’ve got an easy, super tasty and fun treat! We all loved how smooth, creamy and delicious it was! 1. Heat oven to 325°F (163°C). You could also skip baking the crust, if you prefer. 4. Bake crust for 10 minutes (optional) then remove and set in the fridge to cool completely. 5. In a large mixer bowl, beat the cream cheese until it’s smooth and creamy. 6. Add the sweetened condensed milk and mix until well combined. 7. Add the key lime juice and zest and mix until well combined. Set the mixture aside. 8. In another large mixer bowl, add the heavy whipping cream, powdered sugar and vanilla extract. Whip on high speed until stiff peaks form. 9. Carefully fold the whipped cream into the cream cheese mixture in two parts until well combined. 10. Add the filling to the cooled crust and spread into an even layer. 11. 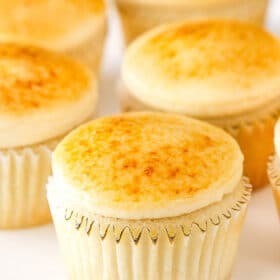 Refrigerate cheesecake until firm, 6-7 hours or overnight. 12. To finish off the cheesecake, remove it from the springform pan. 13. Add the heavy whipping cream, powdered sugar, vanilla extract and key lime zest for the whipped cream topping to a large mixer bowl. Whip on high speed until stiff peaks form. 14. 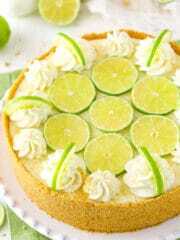 Pipe swirls of whipped cream around the edge of the cheesecake and top the cheesecake with key lime slices. 15. Refrigerate cheesecake until ready to serve. Cheesecake is best for 3-4 days. I asked my mother-in-law, who is from South Africa, and she suggested digestive biscuits – or even better might be Tennis Biscuits. I hope that helps! While I’m not very familiar with buscuits in South Africa or similar countries, the crumblier the biscuit you can find the better. Wikipedia compares them to a digestive. Often graham crackers have a semi-sweet, honey flavor. Most people will crumble the graham crackers in a plastic baggie themselves. They break apart easily. I hope this helps! Thanks Alison! I hope you enjoy it! We don’t have key limes here. would regular limes work? Yes, it’d work. The flavor will be a little bit different. Do you have access to the bottled key lime juice? I never looked but next shopping trip I will!! thank you for your speedy reply. 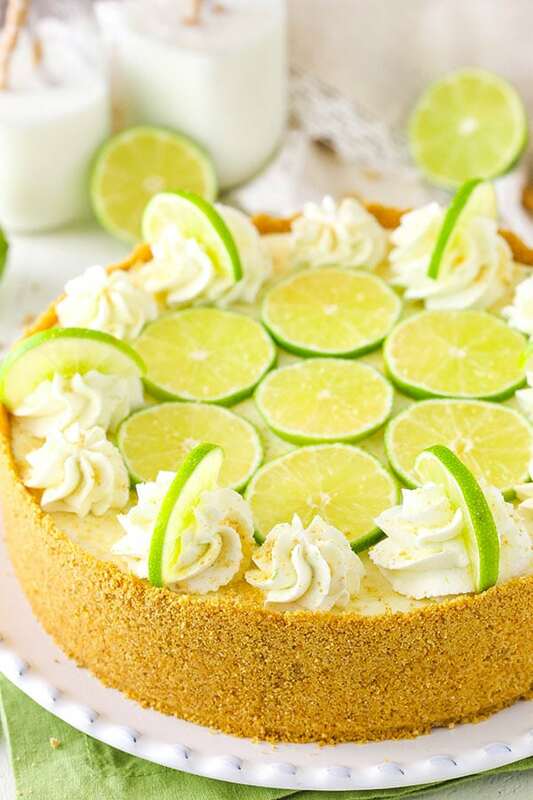 How would I go about making a key lime flavored baked cheesecake (my brother is requesting one for his birthday next week)? 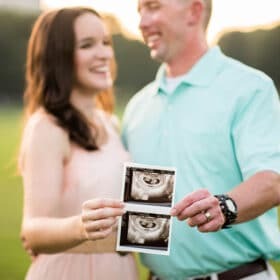 Could I alter your vanilla baked cheesecake recipe (that is his favorite cheesecake) to accomplish this? 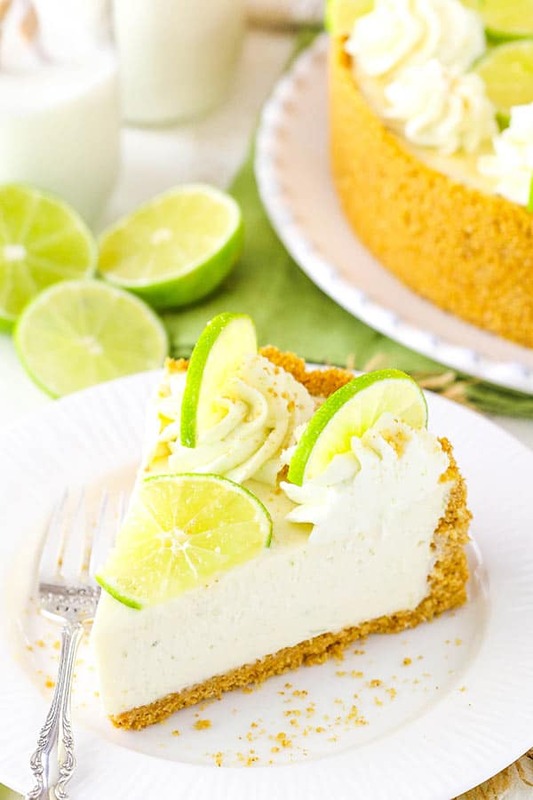 I was thinking of adding a table of key lime zest as listed above for this recipe, but am unsure if adding the juice to the recipe would ruin the texture of the cheesecake. I was also going to make a key lime flavored curd to top the cake with, do you think that would be enough to impart a good flavor? I’d love any advice you could give. So a couple options. Here’s a lemon cheesecake that has lemon curd on top. You could swap all the lemon stuff out for key lime and use that. The other option is that I have a new cheesecake I’m posting on Monday that is lemon blueberry. 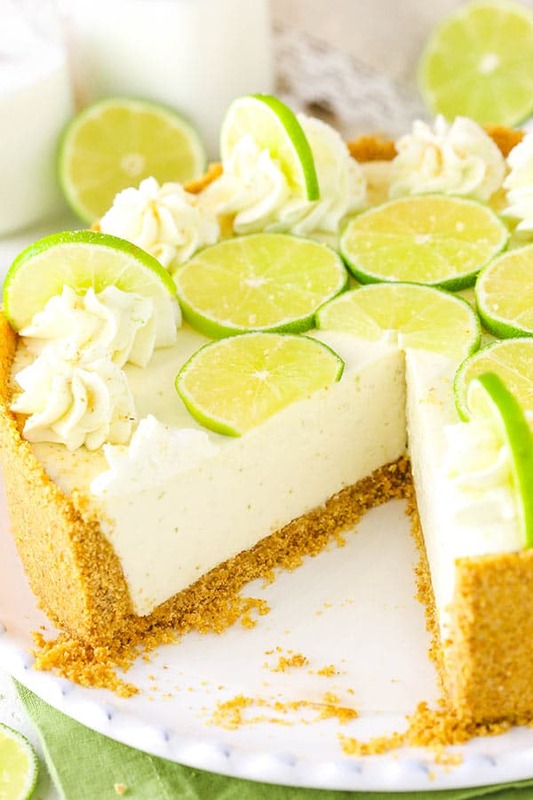 I personally think it’s an improvement on the lemon cheesecake and if it were me, I’d use that one and swap out the lemon for key lime (just leave out the blueberries). You could still do a key lime curd if you want, but I actually think it’d probably have enough flavor without it. Easy and it was delicious!